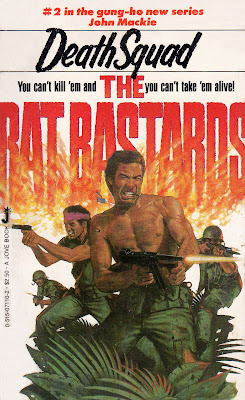 Len Levinson's (as John Mackie) 'The Rat Bastards' series began with “Hit the Beach!”(1983), an outstanding wartime action/adventure novel, careening from the harrowing to the exhilarating and back again like a roller coaster. It wasn’t very likely that the follow-up novel could be just as good, and it isn’t. Although “Hit the Beach!” was tense and exciting, it was also episodic, lacking a real plot. It's simply about a combat platoon on Guadalcanal fighting back waves of Japanese soldiers. But the sequel, “Death Squad” (1983), is a story with a clear beginning, middle and end, and that structure gives it more power. It’s pulp fiction, but it’s extremely well-written, and the characterizations, dialogue and pacing are all superb. In this novel, the platoon has survived the meat-grinder of “Hit the Beach!” and heads out on a highly dangerous reconnaissance mission over to the far side of the island, where they’ll be isolated deep behind enemy lines. Their task is to find out where Japanese supplies and reinforcements have been landing. The mission gets off to a good start but the guys are in for a very rough time and before it’s over there will be snakes, snipers, capture, crocodiles, torture, torpedoes and always (always!) relentless action, bloodshed and suspense. Every time you think you know what’s about to happen, you’re hit with a surprise and just when the adventure seems to be over, there’s a spectacular extended climax that tops everything. Good luck finding a pulp action/adventure novel better than “Death Squad”. War is truly hell for the Rat Bastards, but it’s a 200-page thrill ride for the reader. Thanks for the great review. I'd be desperate to read this novel if I hadn't written it myself.